Hi J - every year, at the beginning of the grilling seasons, after the long winter break, we seem to have to relearn how to grill and bbq to make a presentable meal. 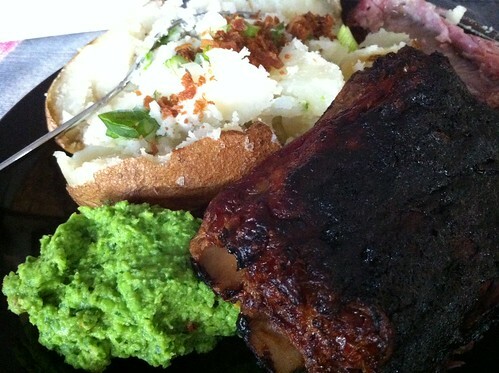 So with that disclaimer out of the way, I present our fail St. Louis ribs. The ribs look really good when I saw them, late afternoon. I was shocked at how they looked when I saw them on the platter. Yikes. G said something something about a grease fire. Sorry about that. Good thing he also made potato. Yum. I attempted to make a Lemony Pea recipe, with the preserved lemons I made. I think I may be the only one who likes peas? Also, it was definitely better warm. I didn't catch or misunderstood the "chill' recipe instruction. Nevertheless, the preserved lemons was really interesting. The rind tasted like a cross between a pickled and salt lemon. I can barely taste it in the finished pea mash. 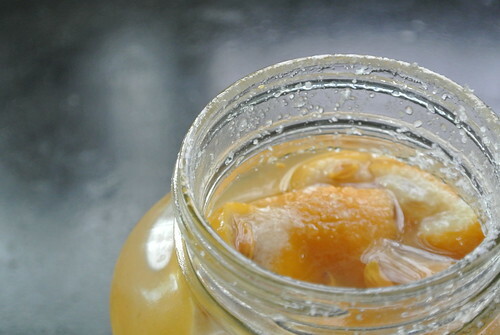 On ward to look for other preserved lemon recipes. It was a meal to forget. We will try again in a couple of week! Last week we celebrated the final birthday of the year: G! Yay! Chester was not impressed. N: How about lamb and chicken? J: No chicken for G!!! 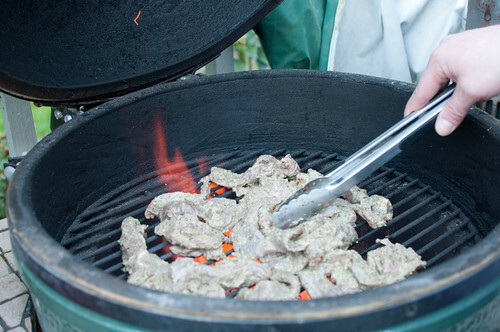 So instead N marinated lamb and beef in a paste of seasoning for many hours before grilling them on the egg. 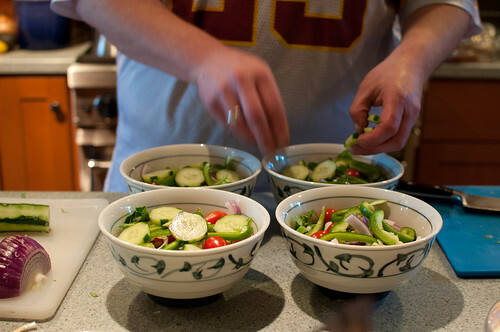 I convinced N to make the salads by explaining that he "makes pretty salads." His Greek salads are usually very pretty: kalamata olives, feta, tomatoes, green bell pepper, cucumber slices, romaine, and pepperoncini. N assembled the sandwiches using a plate of fixins: cucumber sticks, feta, shredded romaine, and heirloom tomato slices. 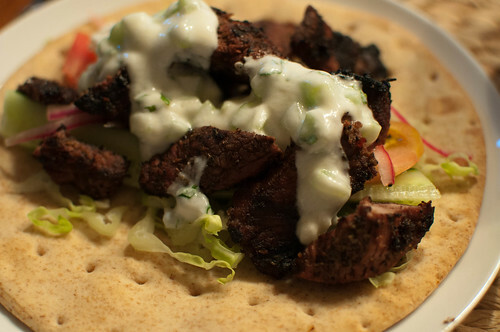 I made tzatziki using this recipe. I strained the Greek yogurt and the cucumber chunks, but not for as long as the recipe suggests. You and N thought it was a little too minty! I also made a bit of quick-pickled red onion for the sandwiches. Yum! After dinner G picked 7 Wonders (BGG) to play. We had quite a discussion this time about the wonder boards -- apparently we had missed one very important aspect of the boards. Some of the boards have a bonus in the second phase of the wonder instead of more victory points (VP). This is to even out the board scoring since some of the boards are worth 15 VPs as complete while others are only worth 10 VPs. However your board and my board we had some question about whether the second stage had to be built in order to use the item of the second stage. The instructions are not clear about this. 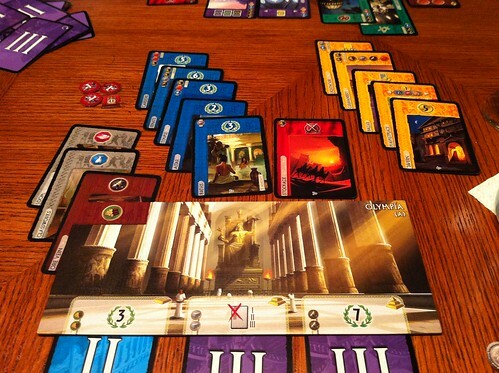 I really like 7 Wonders because it is quick and not difficult, but still interesting. I understand your point about not having enough interaction with the people around you -- it is a sort of stand-alone sort of thing. Even buying resources from your neighbor isn't that interactive -- you just toss a coin or two his way. However I try to keep an eye on what my neighbors are doing -- what resources they have, how beefy their military is, and come Age III, how many of each type of cards they have. The guild cards won me this game once again, mostly because you had a LOT of yellow cards and I used one of the guild cards that gave me VPs for the yellow cards my neighbors had in play. I think the game tries to make it interactive -- you can't ignore your neighbors completely if you want to win -- but at the same time, you're not doing many actions with your neighbor. I also beef up my resources in Age I as much as I can because it seems to help in the later stages. But there are so many different ways to play and win this game. I've seen games where the person won on Science cards. On Guild cards. On free points from the Buildings. I like that aspect of it, too. There's always a way to eke out a victory, even if you're behind in some category. 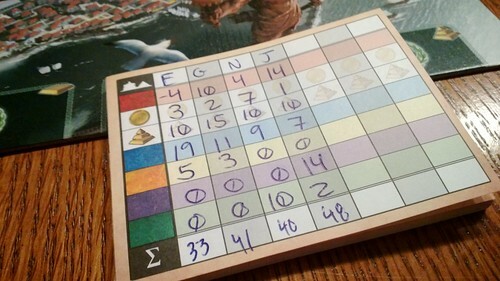 So: I still really like 7 Wonders! It's a bonus that it's quick to play and not difficult to set up. When you told me that G had requested ice cream cake for his birthday, I thought that meant you were going to make one. Ha ha ha! 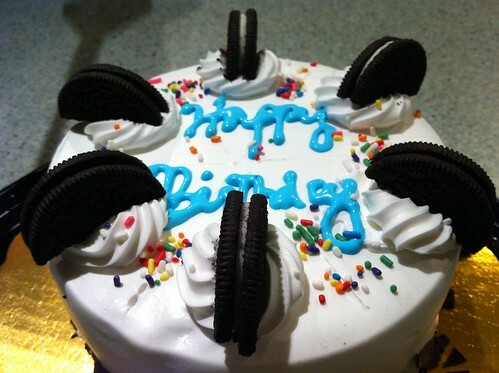 Instead you ordered one from Coldstone and we were all pleasantly surprised at how good it was. A++++++ would order again! As for G's gift of Memoir '44, I was looking for something in the Axis and Allies vein without the lengthy gameplay and possibly with a little more interest for you and I. It's supposed to be good! (though I admit I feel a little guilty for adding another game to your stack when we haven't played all of them yet). I hope it's fun!